Homeowners have been enjoying the classic beauty of hardwood flooring for many years. There are buildings from the early 20th century that still have their original hardwood floors! Whether you’re installing engineered or solid, if you keep your hardwood flooring properly cared for, you can expect it to be around for a long time. Proper flooring care starts with the installation. First, you should be mindful of the climate of the room where you’re installing the flooring. 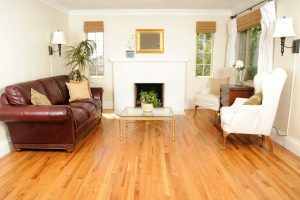 Hardwood is vulnerable to damage from excessive heat, excessive cold, and all kinds of moisture. You also want to make sure your flooring is properly installed. If a floor is not installed properly by a trained professional, it can be damaged. Failure to follow the manufacturer’s installation instructions can also void the warranty. Be sure to call in the professionals at Jason Brown Wood Floors, and we will have your beautiful new flooring installed quickly and professionally. Your professionally installed hardwood flooring will last you for years to come as long as it is properly protected. Different types and species of flooring will have different protection requirements. To protect from sun damage, simply close the curtains or blinds whenever there is direct sunlight. To protect your flooring from all manner of things, be sure to refinish according to the manufacturer’s instructions. Regular refinishing ensures that there is a constant barrier of finish between your flooring and all of the things it may encounter. Attach anti-scratching pads to the bottoms of chairs. Place rugs at outside entrances so everyone can wipe their feet. You can even institute a “no shoes” policy to really keep your floors looking nice! There are also a couple of easy little things you can do to make sure your flooring stays clean. Keep moisture away as much as possible. Be careful not to get furniture polish or hairspray on your flooring. Area rugs and door mats are a good extra layer of protection for high-traffic areas. This entry was posted on Friday, September 29th, 2017 at 1:21 pm. Both comments and pings are currently closed.